Did you know that each and every year, the Queen celebrates two birthdays? And it is soon to be one of them – on the 14th June (at the time of writing), the Queen will celebrate her official birthday, even though her ‘actual’ birthday is on the 21st April. Interestingly, her official birthday doesn’t have a fixed date (hence our ‘at the time of writing’ comment above! ), but it is always a Saturday in June, so that there is good weather (hopefully!) for an outdoor event. Over the years, the event has been developed into a fantastic occasion that’s repeated annually. Known as Trooping the Colour, it’s a military parade that has taken place since 1820 and happens at Horse Guards Parade in St James’s Park, which is only a short walk from DUKES Hotel. Events will begin around 10am on Saturday 14th June, so why not pop into our restaurant and have a spot of breakfast before you make the short walk to St James’s Park and get ready for the parade to begin? The ceremony is full of military pomp and pageantry as the Queen carries out an inspection of the troops from the Household Division. 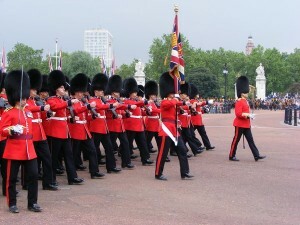 The troops are then lead down to Buckingham Palace by the Queen, where she will then salute and this will be followed by a 41-gun royal salute in Green Park and a 62-gun royal salute from the grounds of the Tower of London. The Queen then joins other members of the Royal Family on the balcony to watch the RAF flypast, which often features the Battle of Britain Memorial Flight and the Red Arrows. Over 1,000 officers are on parade, along with 200 horses, whilst over 400 musicians play as one. This ceremony dates back to the 18th century, when the colours (flags) of the battalion were carried (trooped) down the ranks so they could be seen and recognised by the soldiers. After Trooping the Colour has ended, you won’t have far to come back to us and sample the afternoon tea we have to offer – or maybe enjoy a glass of champagne? And if you don’t live in London, you could always make a weekend of it – we have a large number of rooms you could stay in, from the Dukes Room to the Penthouse. That way you could take the time to explore a lot more about London – there are of course the usual landmarks you could visit, or you could take a look at our recently published blog post on things you didn’t know about London and maybe try out some of the other activities so many don’t usually do.